in Boca Raton near Congress Ave. We have now learned why our favorite waitress with the red streaks in her hair wasn't there...She Quit! We will miss you Charlotte. Anyways, as we have previously posted here, Sal's pizza is not terrible. Compared to what else is around my immediate office area (Big City Pizza is a little further), it is the place I choose to go for a fast slice from time to time. My big issue with Sal's Pizza is not the quality but rather the effort. 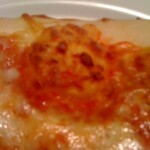 As you can see by the photos, Sal's does not take the time to pop the bubbles on the pizza while in the oven. Do not be fooled by the photos, this bubble was huge in person. Pizza places that have true pride in their pies, tend to open the oven and pop the bubbles with the slicer. Outside of the bubbles, the pizza tasted pretty decent today. The crust was crisp and the cheese was cooked just right for a change. Sal's, if you want us to keep coming back, we ask of you to kindly take the second or two it might take, to take a look in to the oven and see if any pies are in need of popping. You shouldn't serve slices where the bubbles are sometimes 1/4 of the entire slice. I will give Sal's Pizza on Congress and Yamato 4 out of 8 slices.